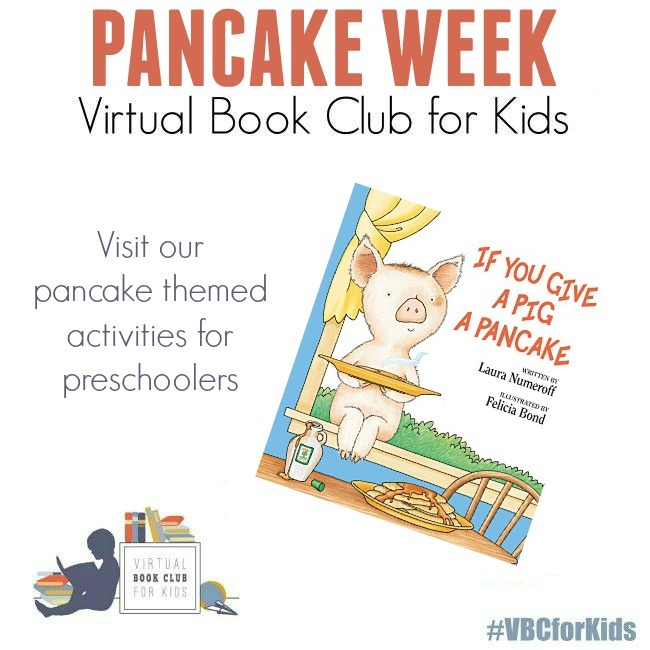 This week we are celebrating Pancake Week as part of our Weekly Virtual Book Club for Kids and we are featuring If You Give a Pig a Pancake by Laura Numeroff! Last week was all about snow and snowmen and snowflakes... and my kids kind of wanted to continue the theme, so we are combining pancakes and snowmen this week! In order to do that, we put together a Snowman Pancake decoration station! To get started, I made a bunch of round pancakes that were varying sizes. I used my awesome pancake pen because it makes the pancakes almost perfectly circular! Once each kid had three pancakes of varying sizes, we started building our snowmen! We started with whipped cream snow. Then we added a strawberry scarf, chocolate chips for eyes and buttons, and another little sliver of strawberries for the nose. My big kids had fun cutting and make their own snowman accessories while my toddler just had fun moving her materials around and then inhaling them while begging for more "cream." If you have ever made creative pancakes like this, what sort of toppings were your favorites?